One of the many reasons people fall in-love with France is, of course, the food. How many other countries have produced numerous dishes that have become household names in Britain: from Moules Marinières to Crème Brulée and Soufflé, via Boeuf Bourginogne and Coq au Vin? From haute cuisine to earthy bistro dishes and lighter, Mediterranean-style fare, France offers a range of food as varied as the country itself. Wherever you go, you’ll be sure to eat well. French cuisine relies on its fresh, local ingredients and each region seems to produce something to call its own. So, starting in the north and working our way south, what are the regional specialities you can expect to try out on your next visit to France? Brittany is the home of the pancake. The savoury variety, galettes, are made with buckwheat, and usually served filled with ham, cheese and a fried egg. 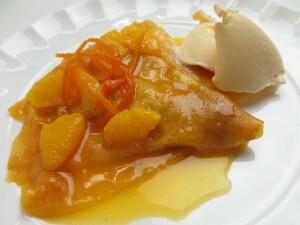 For those with a sweet tooth, the Brittany crèpes are a must, eaten with a combination of sugar, lemon and butter. Neighbouring Normandy prefers its seafood, and in particular oysters and mussels – the classic Moules Marinières hails from here. Apples are also grown in Normandy, producing cider and Calvados, while the ever popular Camembert and Coulommiers cheeses also originate here. These areas are influenced by their proximity to Germany, and staples here are cabbage, which is usually served pickled, and pork, which comes cured as platters of charcuterie. Savoury pastries and tarts are produced here, most famously the Quiche Lorraine. 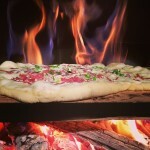 As an alternative, you could always try the Tarte Flambée, a type of pizza topped with crème fraiche and bacon. For the sweeter tooth, it was in Lorraine that the famous little Madeleine sponge cakes were created, usually flavoured with orange, lemon or almonds. 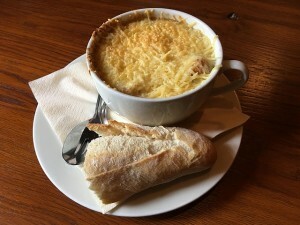 The classic French Onion Soup, or Soupe à l’oignon, was created in Paris in the 18th century, using beef broth and caramelised onions with cheese-covered croutons on the top. It was traditionally considered a poor man’s food, as onions were so plentiful and easy to grow. What we know today as Steak Tartare – raw ground beef served with an egg yolk – was originally known as Steack à l’Americain and served in early 20th century Parisian restaurants with tartar sauce but no egg. By 1938 the sauce had been replaced by the egg, and the dish had become a firm French favourite. Three of the world’s most famous desserts were created in Paris by renowned chefs of their eras. François Massialot (1660-1773) is credited with creating both the Meringue and Creme Brulée. Marie-Antoine Careme, (1784-1833) began life as a Parisian kitchen boy and grew to become known as Le Roi des Chefs et le Chef des Rois, or king of chefs and chef of kings. He is behind many French sauces, among them the Béchamel white sauce. It was with this that he created the soufflé, which can be either sweet or savoury. 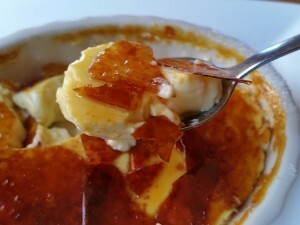 He found that by adding whipped egg whites to the Béchamel sauce and baking it in the oven the result would souffler, meaning to breathe or puff up. The savoury version incorporates herbs, cheese and vegetables, while the sweet is made up of fruits, berries or chocolate. Both the Loire and Burgundy are synonymous with their wines, but what of their foods? In the Loire, much fruit is grown, including cherries, melons, pears and strawberries. It is here that the famous Tarte Tatin was invented, by accident, in a small hotel run by the Tatin sisters in the 1880s. While making a traditional apple pie, Stéphanie Tatin left her apples cooking in butter and sugar for too long, and in an attempt to rescue her burnt dessert, put the pasty layer on top and the dish in the oven. Later that evening she served it upside down to her guests, who enjoyed it so much she decided to carry on making it that way. Burgundy is the home of two famous dishes – Coq au Vin, or chicken simmered in red wine with onions and mushrooms, and Boeuf Bourguignon, which was once considered a peasant dish. This was because cheaper cuts of beef were used, being slow-cooked in Burgundy red wine, with garlic, mushrooms, pearl onions and bouquet garni – a bundle of herbs that usually includes bay leaves, thyme and parsley. This region is also the home of Escargots de Bourgogne, or snails baked in their shells in parsley butter, and, with Dijon as the region’s capital, let’s not forget its famous mustard. 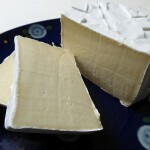 In Franche-Comté, much cheese is produced, including Comté, Mont d’Or and Morbier. While Bordeaux is famous for its wine, the Atlantic Coast and the South-West are regions where duck dishes, such as Confit de Canard, feature heavily. It’s also where many terrines and patés are produced, and of course foie gras. Armagnac also comes from here, and the city of Agen is famous for its high quality plums and prunes, so you might well find yourself rounding a meal off with a slice of Tarte aux Pruneaux, made of prunes marinated in Armagnac. This area is a large producer of cheese, such as Cantal, Reblochon and Bleu d’Auvergne. Famous cheese dishes include Fondue Savoyarde, where chunks of bread are dipped into a melted cheese and white wine mix, and Raclette, where melted cheese is served with potatoes and ham or dried beef. 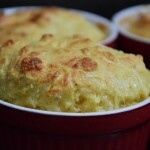 You might also come across Aligot, a combination of mashed potatoes, garlic and cheese. Historically, part of this region was known as Dauphine, and is home of the Gratin Dauphinois, where potatoes are smothered in garlicky cream and slow-cooked in the oven. Lyon, the capital, is largely considered the capital of gastronomy. A Lyonnaise speciality is the Quenelle de Brochet, a type of dumpling made of choux dough that’s usually served in a seafood sauce. Other favourite dishes here include a variety of sausages, including the Andouillette, which is made of coarsely cut tripe. If this doesn’t appeal there’s always the Rosette de Lyon, made of cured pork and cut into chunky slices, or Rillettes, a type of shredded meat pate, using either pork, goose, duck, chicken or rabbit. The Salade Lyonnaise is made up of lettuce, bacon, croutons and a poached egg. If all this sounds a little heavy, you can always wash it down with the two main wines of this area – Beaujolais and Cotes du Rhone. 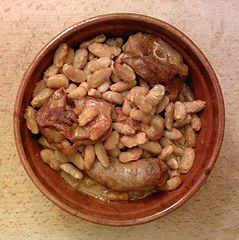 The food in the Pyrenees is greatly influenced by Spain and the Basque country. Here, you can enjoy peppers, tomatoes and spicy sausages. Piperade, in which eggs are scrambled with peppers, is one of its specialities. Bayonne ham also comes from this region, but its best known dish is Cassoulet, made up of spicy sausage, duck confit, pork and white beans. Named after the earthenware dish it was traditionally made in, this hearty stew was a good way of using up scraps of meat and beans, and was traditionally cooked slowly, cooled down and then cooked again. The Languedoc produces a high quality Roquefort cheese from sheep’s milk. In Provence there’s a wide selection of produce to inspire its regional dishes, including the small black Provençal olives and olive oil, lavender-flavoured honey, goats cheese and the famous Herbes de Provence, made up of rosemary, thyme, basil, oregano and marjoram. Ratatouille originates from Provence, with its lovely combination of aubergines, courgettes and peppers in a herby, tomato and garlic sauce. Then there’s the Soupe au Pistou – a light soup made of spring vegetables and served with a healthy dollop of pistou, or pesto, sauce – basil leaves, garlic and parmesan. For something heartier, you could seek out the Daube Provençal, a stew of beef, vegetables, garlic and wine. In Nice, the classic dish to try is the Salade Niçoise, made up of tuna, olives, tomatoes, green beans and potatoes, with an olive oil dressing. Also from Nice, Pissaladière is an early type of pizza, where bread dough is topped with caramelised onions, black olives and anchovies. In coastal Provence, the regional speciality is the fish soup Bouillabaisse, which is so thick with white and shell fish it’s really more of a stew. 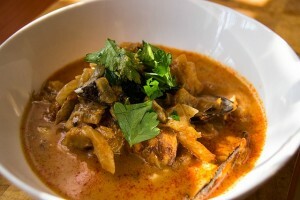 Traditionally a stew cooked by the fisherman’s wife to use up all the scraps of unsold fish, it has reached almost mythical status, with its very own Charter, written in 1980 to protect the dish’s integrity, the types of fish used (rock fish, red mullet, St-Pierre, monkfish and conger eel) and the ritual of serving it. This includes using croutons thickly spread with rouille – a garlic and saffron flavoured mayonnaise. A similar sauce is Aioli, a garlic sauce made with egg yolks, olive oil and lemon juice, and a favourite spread is Tapenade, a purée of olives, capers, anchovies with olive oil. It was in Monte Carlo that the Crèpe Suzette was allegedly invented – for the visiting Prince of Wales, the future King Edward VII, who was dining at the Café de Paris. Despite the pancakes doused in liqueur accidentally catching fire and caramelising, they were served to the prince and deemed delicious, and instantly named after one of his guests. And finally, to finish off all these goodies, if you’re travelling through the Var, why not try the Tarte Tropeziènne, a cream-filled brioche? It was created in 1955 in St Tropez by a Polish pastry chef working on the set of the film And God Created Woman. The story goes it was Brigitte Bardot herself who named it. 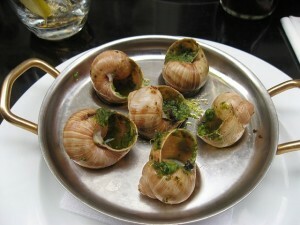 Not only is French food a delight, but so are many of the stories behind its most famous dishes.